Smith and Cross has been flying off my shelves lately. I must admit I’ve been joining my patrons in its consumption. And at the same time joining a historic tradition that traces its linage all the way back to 1788 as one of England’s oldest producers of sugars and spirits. Thank you Hayman Distillers and David Wondrich for bringing back this marvelous spirit. 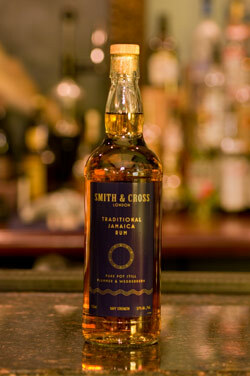 If you’re in the market for a new rum I highly recommend giving Smith and Cross a chance and this is why. Upon opening the bottle you get the powerful aroma of exotic fruit and spice. Immediately you realize this isn’t your ordinary rum. As soon as I open the bottle patron’s from across the room perk up. The smell is mesmerizing, taking you to a tropical paradise. The wild yeast, indigenous of Jamaica, is responsible for this rum’s heavier body and flavor. As you’ll notice on the bottle, this rum only contains Wedderburn and Plummer pot still distillates and is aged for 3 years in white oak. Take caution with this rum because it rings in at a whopping 114 proof. This is a treat for bartenders who want to recreate old recipes like the Planter’s Punch and other tiki style classics that call for gold Jamaican rum. Recently I’ve been using Smith and Cross in a recipe created by one of my favorite bars The Franklin Mortgage and Investment Company in Philadelphia. The cocktail is called The Six Inch Gold Blade. It’s a wonderful marriage of bitter, sweet and smokey and an excellent execution featuring Smith and Cross Rum. I was just wondering if you should use a bit less of Smith and Cross when you make drinks, or just the same. As it’s so high in alcohol I guess the drink would be very strong ( maybe too strong ) too. What if I’d make a Mai Tai for example and it calls for 2 oz of rum ? What would you do to make it balanced and not too strong ? Paul, You could half and half it with another rum to lower the alcohol. I have even used a half ounce before as flavoring. Smith & Cross has a huge flavor so it will definitely stand out.